So guys here it is because of the phenomenal number of views for the quinoa chapati recipe, another variation for the same but this time with spinach making it healthier and Greeener!!!! Truely a ” green grain ” recipe. A meal in itself you will find the results of this cooking endeavour lip smacking delicious, and yes you can subsitute quinoa flour with wheat !!! Now slowly add the pureed spinach and knead the dough. You may add a tbsp. oil so that the chapati/ paratha are soft. Soon the dough starts to take shape and come together, as the quinoa flour is sticky compared to wheat flour, lot of dough will be sticking to your hands. At this stage use a little oil to grease your palm and knead the dough, this will help some dough to come off your palm. For the remaining dough sticking on to your palm use a butter knife to scrape it. Divide this dough into 6 – 8 balls of equal size. Meanwhile heat a seasoned cast iron griddle or nonstick skillet. Roll the ball between both your palms and make a smooth ball. Roll the ball in dry flour and with a rolling pin carefully roll it out an inch or two and carefully peel it off the board and roll it in the dry flour again. Use a spatula to peel it off the board as it may break but wil get better with practice. Carefully continue to roll and repeat the above step till you have a circle of 4-5 inch in diameter ( with practice you can make a bigger circle without it breaking apart ) of even thickness. Carefully peel it off the board and place it on the heated skillet on medium heat. This spinach tortilla / paratha will be thicker than the chapati and WILL take few minutes longer to cook because of its thickness but believe me the result justifies the time spent!!! Use a paper towel or a clean dish towel to press the thicker edges so that they are well cooked. Turn it few times at regular intervals, apply little ghee on both sides and press the edges so that there are no uncooked areas left, also ensuring that it does not become crisp and stays soft. You will see nice brown spots now and rest of the paratha with a golden hue. Do not let these instructions overwhelm you, with practice you wil get finger licking results!!! Patience has never had a sweeter reward or should I say SAVOURY reward!!!! 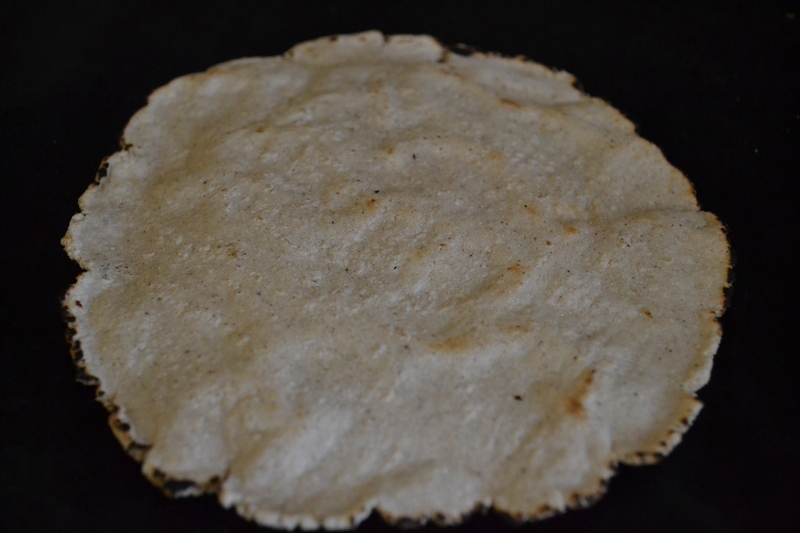 Brush the tortilla with little ghee on both sides wrap it in clean cheese cloth and keep in a covered glass dish or steel container so that they stay soft. Serve with plain yoghurt spiced with black pepper and ground roasted cumin powder and ENJOY!!!! 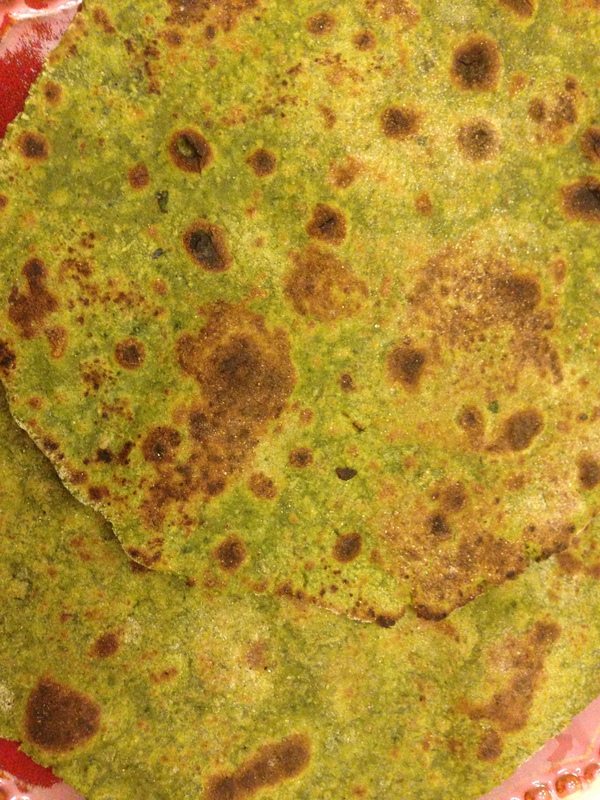 Many people have been interested in the quinoa chapati recipe. I make those very frequently but adding little amaranth flour (another gluten free grain ) makes rollng these chapatis so much easier, they look and taste the same. And they are so goood!!!!! So try this variation and let me know what you think. I personally love and prefer this version. Knead the dough adding little water at a time to the flour and rubbing it between your fingers. 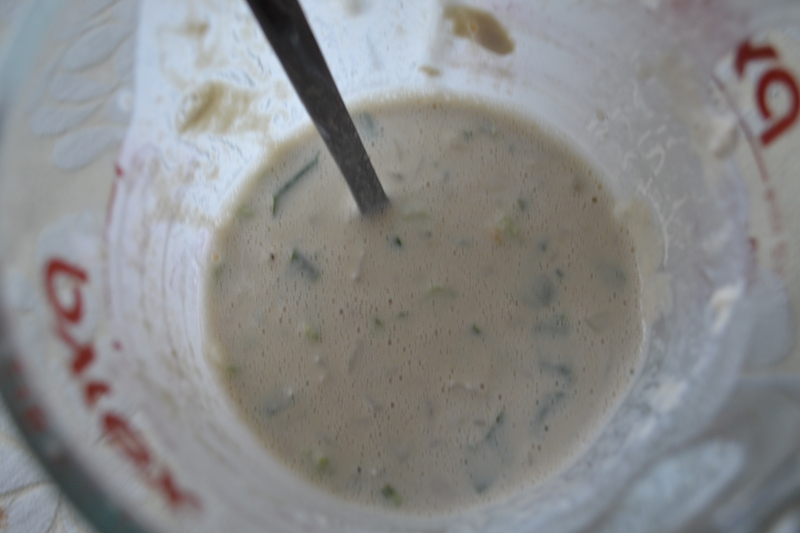 Continue to add the in small quantities till the dough starts to come together and is not very wet. Make a round ball and let it sit for half an hour or more. Divide this dough into 6- 8 balls of equal size. Meanwhile heat a seasoned cast iron griddle or nonstick skillet. Roll the ball in dry flour and with a rolling pin carefully roll it out an inch or two and carefully peel it off the board and roll it in dry flour again. Carefully continue to roll and repeat the above step till you have a circle of 3-4 inch diameter of even thickness. Use a spatula and carefully peel it off the board. Do not be disheartened if the chapati does not come off the board or tears while doing that. Few attempts are necessary before you get nice soft, smooth chapatis. After 20 seconds or so when the chapati loses its wet look, turn it on the other side, let it cook for another 20 seconds and you small bubbles turn it again, if the chapati is rolled evenly and without any tears it will puff up (may puff up partly). Use a paper towel or a clean dish towel to press the thicker edges so that they are well cooked . 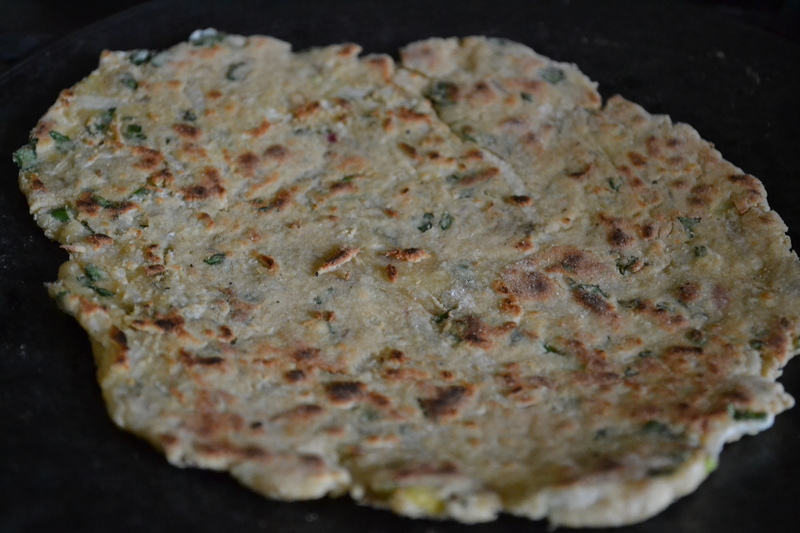 Normally a traditional whole wheat chapati is cooked in the 3 steps described above but quinoa chapati needs to be turned more than few times before it is well cooked. Once cooked, you may apply butter or extra virgin olive oil, or ghee and wrap in a soft cheese cloth so that they stay soft . Curried Black Kale and Mushroom Pilaf – Easy Breezy gluten Free !!!! Everybody seems to be eating and cooking quinoa these days. The staple of Incas has become a very popular superfood for rest of the world.Too much of a good thing may be ? The weather in our part of the world is icy again so I was not looking forward to eating another cold ( tried many variations of quinoa salad!!! ) quinoa salad. 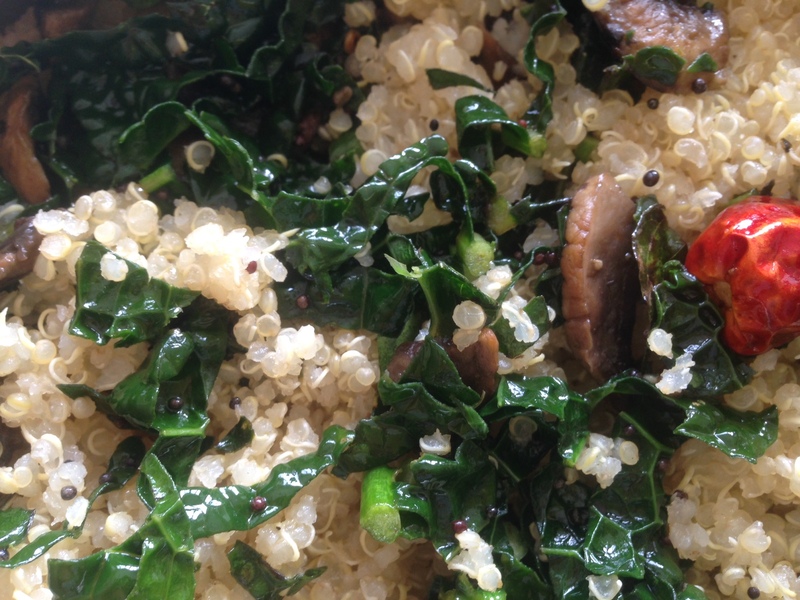 Therefore I came up with this simple recipe of hot quinoa pilaf seasoned with mustard seeds,curry leaves and combined with another popular superfood black kale and mushrooms. Just the guilt free food to warm up your insides on a cold icy winter afternoon. 1. Heat the oil in a heavy bottom skillet and add mustard seeds and cover with a lid. 3. Add curry leaves and whole red chillies and stir for a minute, now add kale and sliced mushrooms and garlic. 4. Sautè for a few minutes till the mushrooms are glistening and kale is a fragrant bright but dark green colour. 5. Add salt and mix the kale mixture into the cooked quinoa and serve hot. 6. You may add some lemon or lime juice before serving. 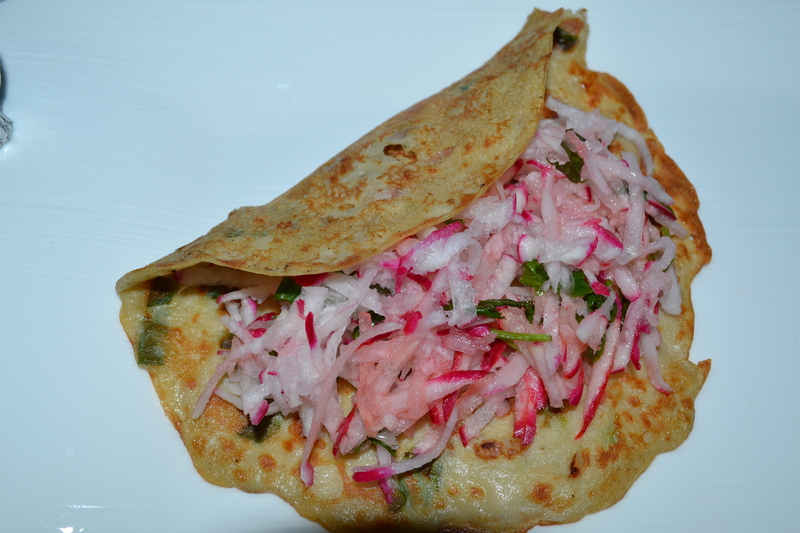 QUINOA/ Amaranth Radish Tortilla /Paratha Not SO EASY, BREEZY Gluten free But SOOOO Good!!!! I have stated it before that I am always concerned about mixing too many different flours, for one it is best to keep things simple and most importantly with people suffering from so many intolerances and allergies and sensitive digestive disposition, too many ingredients in one food can cause confusion. Here I have added little amaranth flour to the quinoa flour to make the dough more pliable and not crumbly. 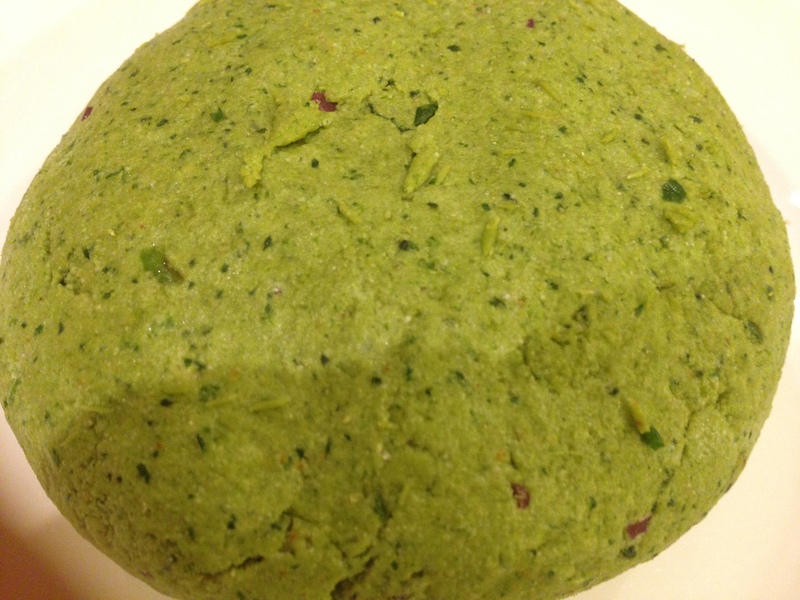 As I have discussed in earlier recipes with amaranth flour, it has a very strong taste not very palatable but the dough inspite of being gluten free it is very easy to work with, is not crumbly and it is a breeze to roll. I am trying to capitalize on the key characteristic of this flour by mixing it with other gluten free but dry crumbly flours so that they hold better and then roll better and does not affect the taste. Voilla!!!! Also I do like to hear your comments, I do want to know what your experience is like. Please do not hesitate to share your thoughts. 1. Add little salt to the flour and mix. 2. Now add raddish, ginger, chillies, cumin , fennel and mix. 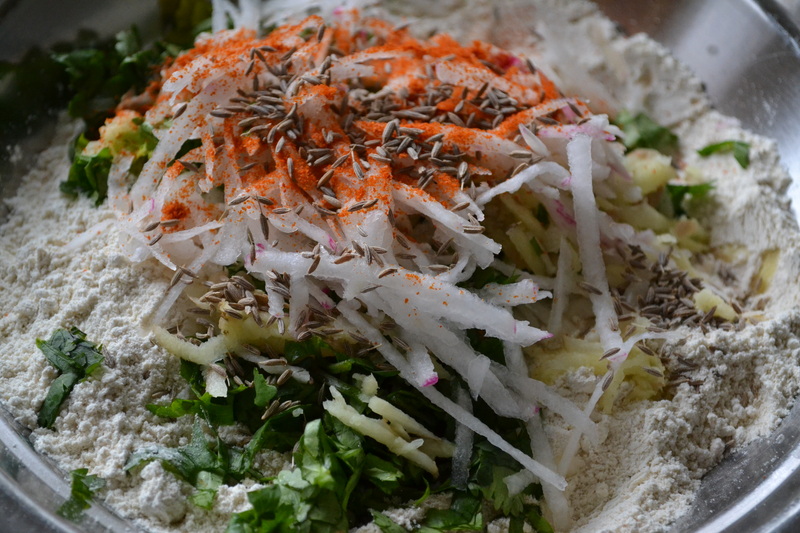 Because of moisture in the radish you do not need too much water to knead the dough but also that is what makes it challenging to roll the chapati. 3. Add water very slowly mixing radish mixture thoroughly into the flour. Adding salt also draws the moisture out from the vegetables so add water very little at a time, slowly and carefully.Because of this you need to roll the tortillas right away as the dough gets moist when kept too long. 4.Try to keep the dough a little dry and add 1 tbsp. of ghee to the dough so the dough peels off your palm and bowl completely. 5. Soon the dough starts to take shape and come together. 6 .At this stage use a little oil to grease your palm and knead the dough, this will help the dough to come off your palm and the bowl completely. This dough is not as sticky as that of only quinoa flour as it has amaranth flour mixed in it. 8. 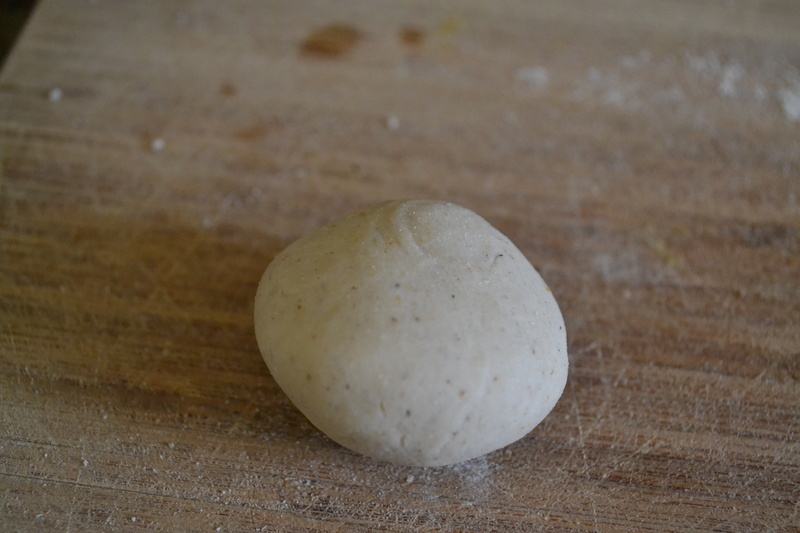 Divide this dough into 4 – 6 balls of equal size. Meanwhile heat a seasoned cast iron griddle or nonstick skillet. 9. Roll the ball between both your palms and make a smooth ball ( it would not be smooth like quinoa chapati because it has so many herbs and grated radish . 10. Roll the ball in dry flour and with a rolling pin carefully roll it out an inch or two and carefully peel it off the board and roll it in the dry flour again. Use a spatula to peel it off the board as it will break and crack easier than plain quinoa chapati but still much easier than other gluten free flours like millet, corn ,sorghum etc.Some people even use cling wrap to roll it. But I find the old fashioned way the best. 11. 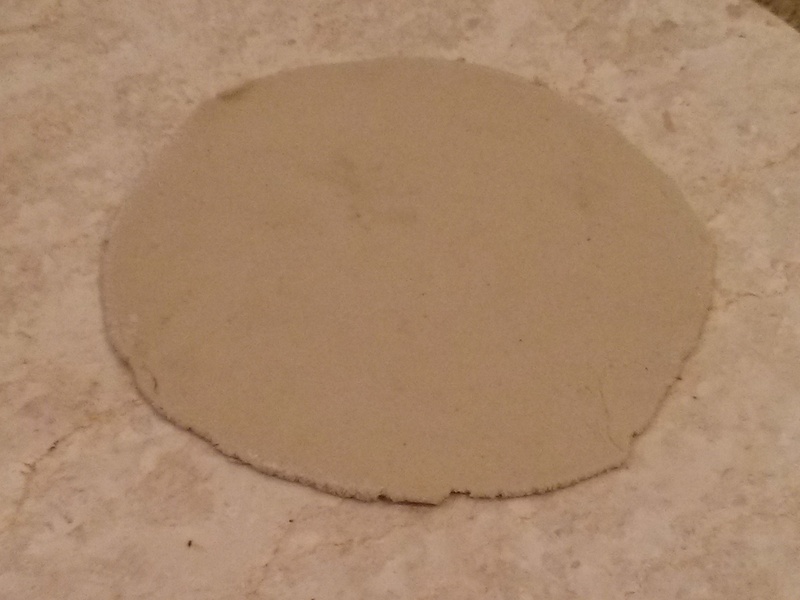 Carefully continue to roll and repeat the above step till you have a circle of 4-5 inch in diameter ( with practice you can make a bigger circle without it breaking apart ) of even thickness. 12. Carefully peel it off the board and place it on the heated skillet on medium heat. 13. This herbal tortilla / paratha will be thicker than the chapati and WILL take few minutes longer to cook because of its thickness but believe me the result justifies the time spent!!! 14. Use a paper towel or a clean dish towel to press the thicker edges so that they are well cooked. 15. Turn it few times at regular intervals, so that there are no uncooked areas left, also ensuring that it does not become crisp and stays soft. You will see nice brown spots now and rest of the paratha with a golden hue. 16. Do not let these instructions overwhelm you, with practice you wil get finger licking results!!! Patience has never had a sweeter reward or should I say SAVOURY reward!!!! 18 .Brush the tortilla with little ghee on both sides wrap it in clean cheese cloth and keep in a covered glass dish or steel container so that they stay soft. When exposed to air for prolonged period of time they become crisp, keeping it enclosed they stay warm in the steam. 19. Serve with plain yoghurt spiced with black pepper and ground roasted cumin powder and ENJOY!!!! I bring to you today an easy, colourful, delicious, nutritious dish loved by young and old alike. It is full of antioxidants and polyphenols and is a high protein and high fiber dish and is lipsmacking !! what more could one ask for !! Hope you will enjoy it as much as we do. 1. 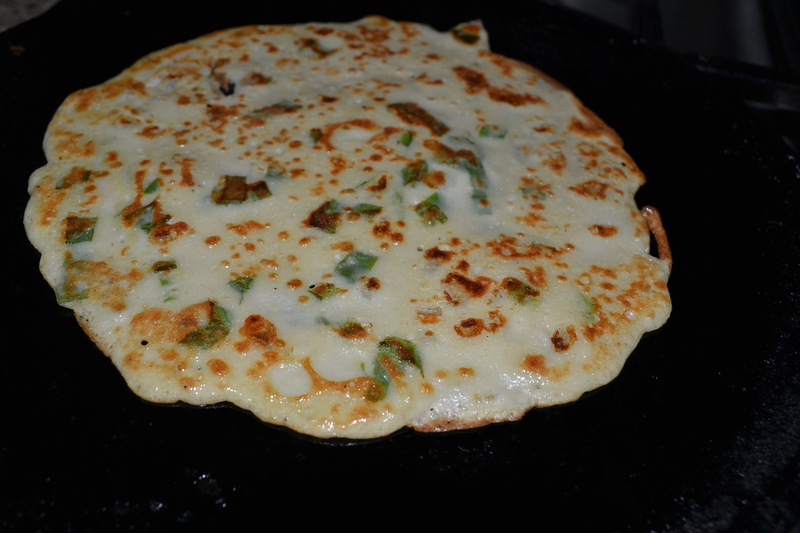 Heat the oil in a skillet on medium heat, add leeks and jalepenos and saute’ for a few minutes. 2. 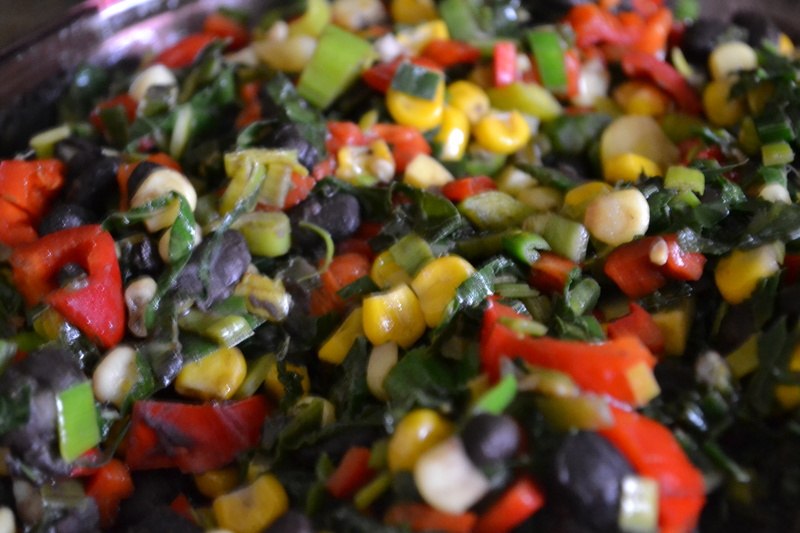 Add red pepper, corn, garlic and greens and cook for 8 – 10 minutes. 3. Add the boiled beans, cumin powder and cook for another 5 – 7 minutes. 4. Add cilantro and salt and mix the mixture well. The filling for the tortillas is now ready. 5. Heat a cast iron skillet or a Panini press to make quesidillas. 6. Warm and slightly toast 2 tortillas on one side only. 7. Take one tortilla and spread 3/4 tbsp. of cheese on the cooked side, then spread 2 tbsp.of vegetable filling and spread little more cheese and cover with another tortilla with uncooked side on the outside and grill it in the Panini press. You may brush some butter or ghee on the tortilla. 8. As the cheese melts the tortillas will stick together and they will be golden brown and have grill marks if done in the Panini press, they roast very well even on the cast iron skillet or a non stick one. 9. Cut the tortillas into 4 quarters and serve with salsa or guacomole. 10. Enjoy!! 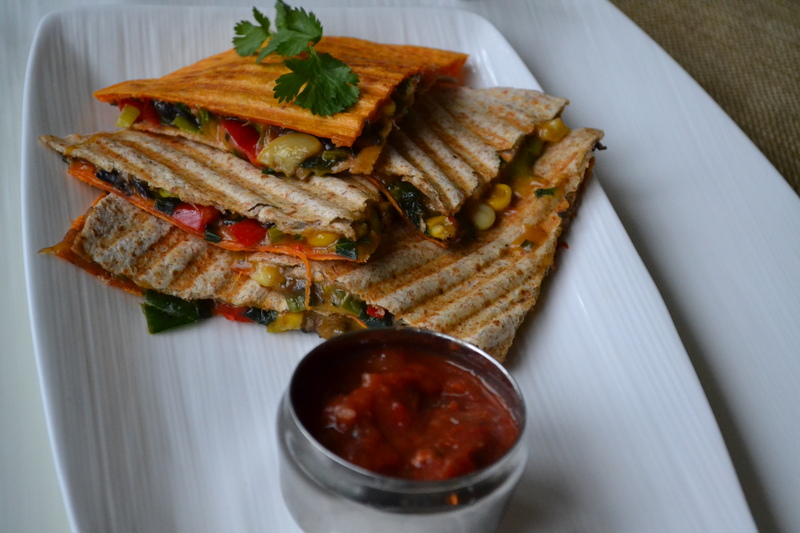 beautiful, nutritious, colourful and delicious complete meal quesadillas any time of the day. 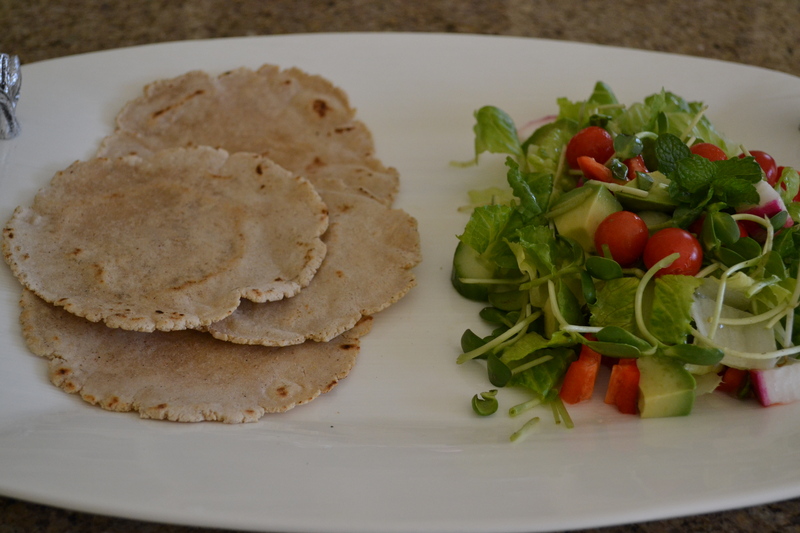 SORGHUM CHAPATI / Easy Breezy Gluten Free, puffed another Eureka moment !!!!! Life is all about balance and yes I am talking philosphy as it pertains to our everyday life , even when cooking in the kitchen. In the process of using different gluten free flours for making chapatis some like quinoa flour are a HIT others are a MISS, well not really as I do not give up easily when it comes to cooking. 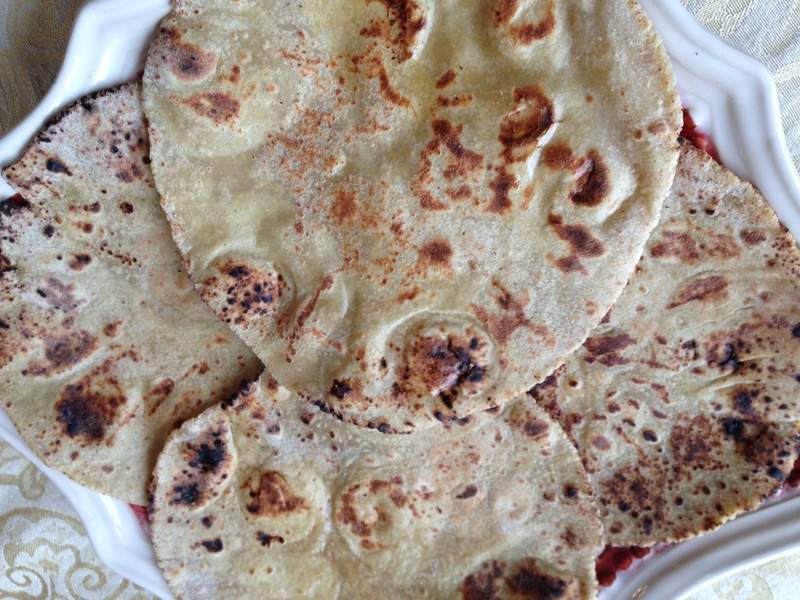 So today I bring you Sorghum chapatis. Sorghum originated in Africa thousands of years ago, and then spread through the Middle East and Asia via ancient trade routes, travelling to the Arabian Peninsula, India and China along the Silk Road. Today sorghum remains a staple food in India and Africa, and is growing in popularity in America. It’s the third most important cereal crop nationally and the fifth most important around the world. Sorghum flour is a powerhouse of nutrition and adds great flavor to gluten-free baking. It is high in protein, iron, and dietary fiber, making sorghum flour welcome in pantries around the world. Sorghum flour is high in antioxidants, which support cardiac health. In addition, the starch and protein in sorghum take longer than other similar products to digest. Since it ltakes longer to digest it is great for a diabetic diet. As a rule I do not like to mix different flours for many reasons, one of them being one kind may agree with you more than the other. Sorghum flour is not an easy grain to work with, dry and crumbly like the dry and arid climate it grows in, the dough breaks as you try to roll it. In certain parts of India where it is a staple grain lot of ghee or oil is used along with some water to moisten the dough and flatten it with the palm (that is also the reason, the grain considered a heating grain is eaten in colder months ). It is very difficult to roll it on a board. Even to flatten it with your palm requires lot of practice and skill. Well to cut the long story short I have added very small quantity of amaranth flour which is dense and rolls very easily to balance the dry, crumbly sorghum. It worked so well that it is now another Easy Breezy Gluten Free !!! Eureka moment. These are small but very satisfying feel GOOD ( literally !!! ) in your gut victories !!! Continue to add the water in small quantities till the dough starts to come together and is not wet. The dough is ready when it starts to peel off your hands. Grease you palm and knead the dough some more to make it more pliable. Divide this dough into 4 -6 balls of equal size. Meanwhile heat a seasoned cast iron griddle or nonstick skillet. Roll the ball in dry flour and with a rolling pin carefully roll it out an inch or two and carefully peel it off the board and roll it in dry flour again. Adding amaranth flour makes the dough very easy to roll and it does tear as easily . Carefully continue to roll and repeat the above step till you have a circle of 3-4 inch diameter of even thickness. Use a spatula and carefully peel it off the board. The edges are not as smooth as that of wheat flour or Quinoa but you can cut the frayed edges with a knife to give it a smoother look. 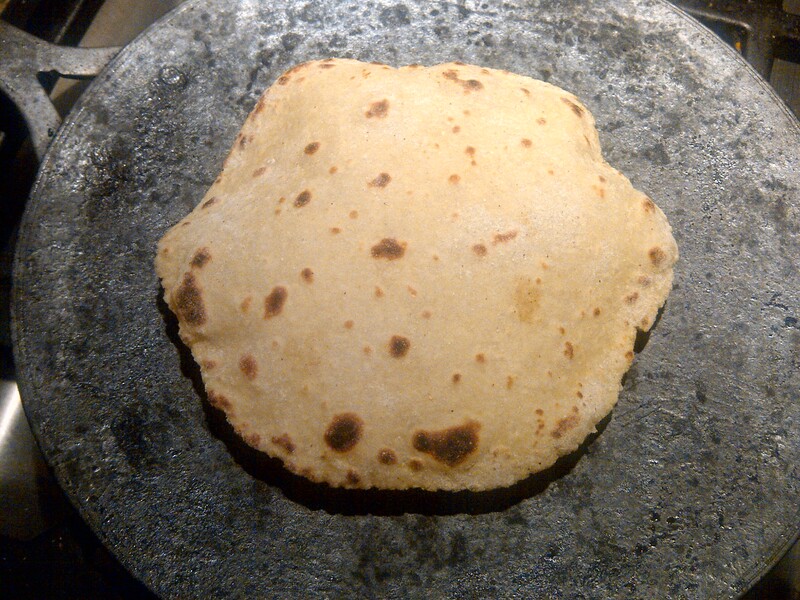 Normally a traditional whole wheat chapati is cooked in the 3 steps described above but sorghum chapati needs to be turned more than few times before it is well cooked. Once cooked, you may apply butter or extra virgin olive oil, or ghee and wrap in a soft cheese cloth and put it in an air tight glass or metal container. When enclosed fresh and hot in the container in the steam they stay soft. Enjoy !! Serve with plain yoghurt, curries and salad. 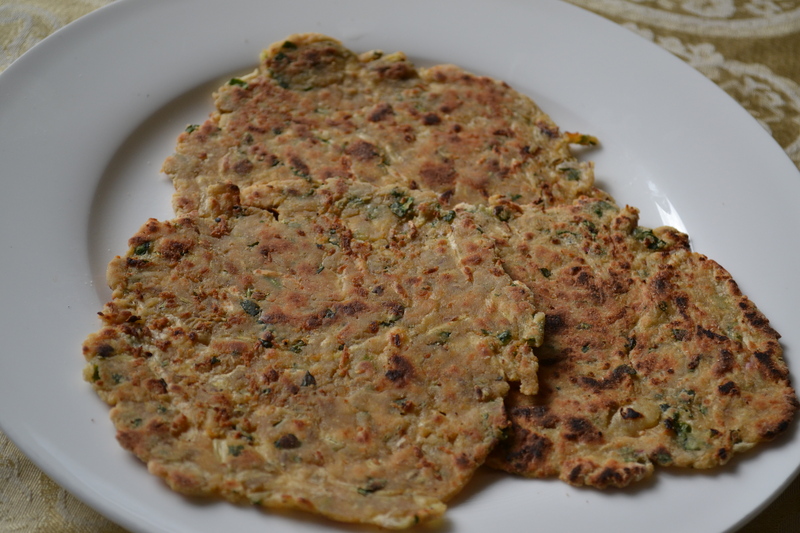 I see lot of interest for Quinoa chapati recipe. If you have tried making it, share with me what your experience has been like, any difficulties etc. With practice the results will be delicious and very satisfactory. 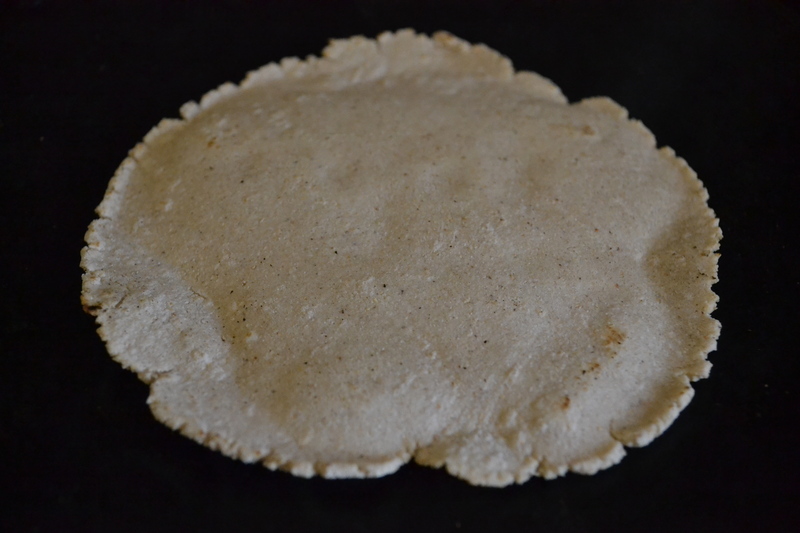 Today I bring to you a very easy, quick alternative to quinoa chapati,a crepe made from quinoa flour.It tastes delicious and is a breeze to make. Hope you will have as much fun making it as I did. The melange’ of flavours and textures is bound to please the most discerning palates. 1. Heat a well seasoned cast iron skillet or a non stick pan on medium heat. 2. First mix the flour and water (adding water in stages not all at once) thoroughly so no lumps remain and then add all the other ingredients ( except oil or ghee). 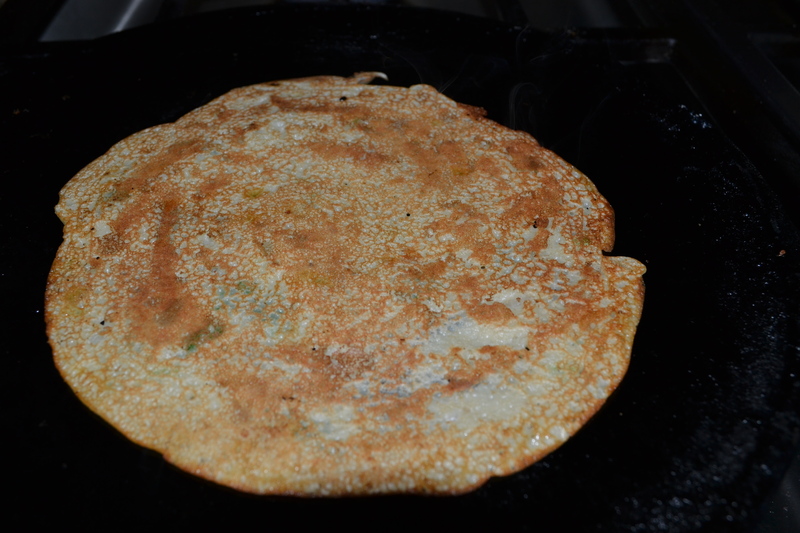 The consistency of the batter should be runny but not watery, if it is then the crepes break and stick. 3. Pour a small ladle full or 2 -3 tbsp. of batter on to the skillet and spread it evenly with the spoon in a circle ( should give you a 5-6 inch circle). And now put a little oil around the whole crepe. 5.With a spatula flip up the crepe from one side to see if it is brown and crisp, if it is then it is ready to be flipped. 6.Once the crepe is turned let it roast and cook on the other side for few minutes on medium heat making sure it does not char and become too crisp. 7. Continue making the crepes . 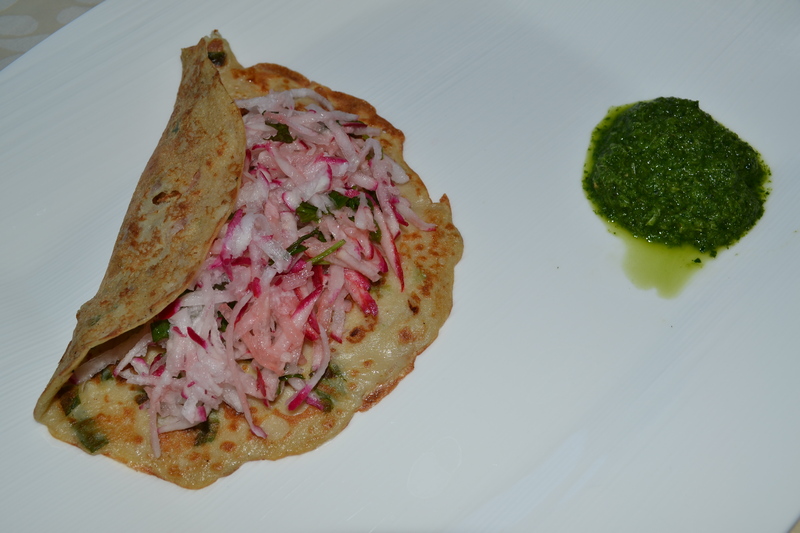 8.Serve crepes with crisp raddish slaw stuffed into them and green cilantro mint chutney. ENJOY!!!! Mix the above and serve stuffed into crepes. Blend or grind all the above ingredients in a mixer or a blender till it is a smooth mixture of even consistency. Store in a glass jar and refrigerate, can be stored for 8- 10 days but starts to lose its vibrant bright green colour as it ages.